Floyd Mayweather has defeated Conor McGregor in their big-money fight at the T-Mobile Arena in Las Vegas, with the referee ending the fight in the tenth round. Floyd Mayweather versus Conor McGregor, one of the most anticipated fights of all time, is here. There’s no more talking, no more press conferences and no more ridiculous outfits. Join The Roar for a blog and round-by-round updates from the main event, brought to you live from the T-Mobile Arena in Las Vegas, starting from 11am AEST. The headline fight is expected to take place at approximately 2pm AEST, but may be much later depending on the length of undercard fights. We have the official weight of the gloves – 8oz – and the official weights of the fighters, Mayweather at 149lbs and McGregor at 153lbs. It’s been a circus, but why shouldn’t it? McGregor is making a career-high payday – what would you do for an estimated $70m? A 40-year-old retired boxer beating a 29-year-old mixed martial artist in his prime, who is the face of the UFC, or, a 29-year-old mixed martial artist conquering a 40-year-old retired boxer. There is plenty that could be talked about and has been talked about. Have the UFC lost their biggest star to boxing? Will Mayweather’s age affect the result? Are the skills of UFC transferable to the boxing world? In the end, none of it matters, and the time for talk is officially done. 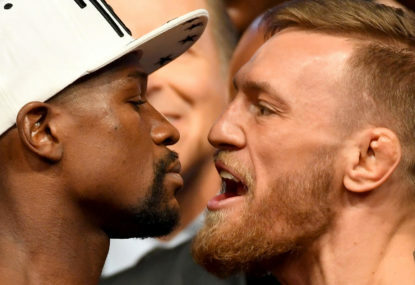 Instead, it’s time to find out who wins this battle of Floyd Mayweather versus Conor McGregor.